Dr. Nidal Saifi, chief medical officer of the Lutheran World Federation’s Augusta Victoria Hospital in Jerusalem. 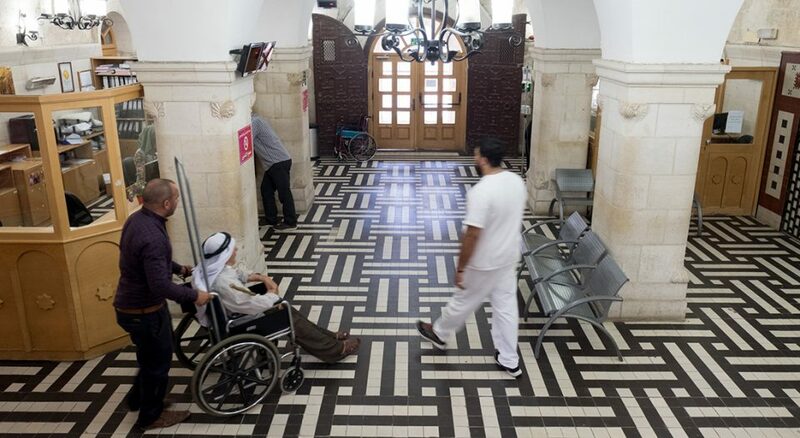 Patients and staff make their way through the lobby of The Lutheran World Federation’s Augusta Victoria Hospital in East Jerusalem. Life-saving medical treatments at The Lutheran World Federation (LWF) owned and operated Augusta Victoria Hospital in Jerusalem have been put in jeopardy by U.S. budgetary cuts to East Jerusalem hospitals announced by the Trump administration in early September. Trump said his administration would cut more than $200 million in aid to medical and humanitarian organizations such as Augusta Victoria. He announced earlier the U.S. would withhold $300 million from the U.N. Relief and Works Agency for Palestinian refugees. U.S. funding to Augusta Victoria normally is around $11 million annually, according to a statement released by LWF. Five other area hospitals will be affected by proposed cuts. Located on the Mount of Olives in East Jerusalem, Augusta Victoria has served Palestinians since 1950. 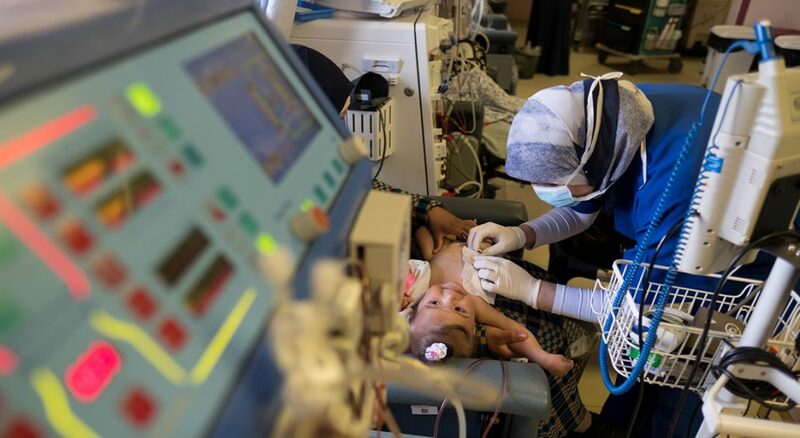 According to Medical Director Nidal Saifi, it is the only hospital for the 5 million Palestinians that offers radiation and chemotherapy for cancer patients and hemodialysis treatment for children with kidney disease. Nearly 20 years ago, in an agreement with the Palestinian Authority, the hospital began specializing its care to meet critical patient needs not being addressed. Ninety percent of the hospitals’ patients come with insurance from the Palestinian Authority, which has been unable to pay its patients’ full medical bills. The U.S. and European Union have contributed financially to the Palestinian Authority to avoid a mounting financial crisis for the East Jerusalem hospital network. Said Ailabouni, ELCA interim desk director for Europe and the Middle East, said just as Jesus was a healer not only for his fellow Jews but for all people, so too is Augusta Victoria an integral part of providing services to all members of the Palestinian population. Augusta Victoria has been able to operate because of the support of LWF member churches, like the ELCA—which has contributed $85,000 in fiscal year 2018 and also committed $50,000 to the hospital’s emergency response in Gaza—and longstanding partnerships with countries like the U.S.
For the next few months nothing will change in the Augusta Victoria patients’ medical treatments, Bajjali said. She said the hospital is in touch with church and other supporters in the U.S. and Europe to put together a sustainable long-term plan so they will not be dependent on outside sources of income. Saifi said patients have been anxious since hearing the news, and the hospital medical team and social workers have been working to allay their fears. 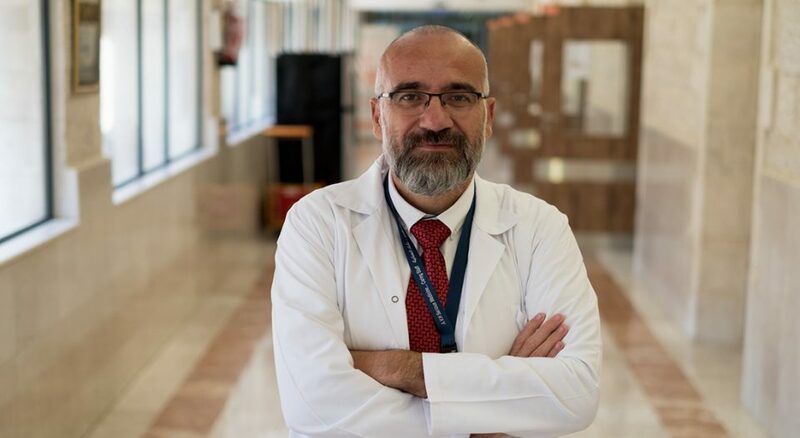 An important part of the success of medical treatment is the patients’ psychological outlook, he said, so they are trying to maintain the patients’ hope. In the meantime, said Bajjali, the medical bills keep piling up and every first of the month the hospital needs $2 million to pay for the vital medications. “We will not be able to continue for very long,” she said. The ELCA provides ongoing support to Augusta Victoria through member gifts to ELCA World Hunger and Lutheran Disaster Response. Give now and your gifts will be used over and above our church’s ongoing, annual support to prevent interruptions to the lifesaving, critical care provided to children and other patients. To learn more and contact your elected officials, visit the Peace Not Walls blog. Judith Sudilovsky is a freelance journalist who has covered the intersection of faith, politics, people and hope in Israel and the Palestinian territories for 25 years.